Acquired: Signed as a free agent on June 4, 2012. Re-signed Dec. 19, 2013, again on Dec. 22, 2015, and again on Oct. 12, 2018. 2018: In 18 games (18 starts), Sewell finished with 38 defensive tackles, seven quarterback sacks and one reception for 16 yards. 2017: In 17 games (17 starts), Sewell led the “big fellas” up front with 36 tackles, including seven quarterback sacks, one field goal block, and one fumble recovery. In the West Semi-Final, Sewell recorded three tackles. In the West Final, Sewell recorded four defensive tackles. Sewell was named a West All-Star and CFL All-Star for the fifth consecutive year. 2016: In 18 games (18 starts), Sewell recorded 38 tackles and 11 quarterback sacks. He was the Eskimos Most Outstanding defensive player and a West Division All-Star for a fifth consecutive season. In the Eastern Semi-Final against Hamilton he recorded three defensive tackles and in the Eastern Final against Ottawa he recorded six defensive tackles and one quarterback sack. Sewell was named a CFL All-Star for a fourth consecutive season. 2015: In 18 games (18 starts), Sewell recorded 35 defensive tackles, four quarterback sacks, one forced fumble and one knockdown. He started in the West Final at defensive tackle and recorded three tackles and one forced fumble. In the Grey Cup, Sewell recorded three defensive tackles. Sewell was named a West Division All Star and a CFL All-Star for the third consecutive season. 2014: In 17 games (17 starts), Sewell recorded 49 defensive tackles, nine sacks and one special teams tackle. In Week 17, he totaled a career-high 44 defensive tackles. 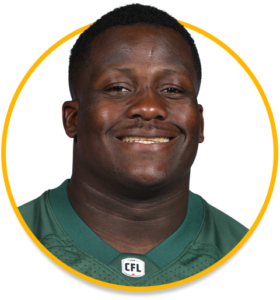 In the West Semi-Final against Saskatchewan, Sewell recorded three defensive tackles. In the West Final against Calgary, he recorded two defensive tackles. For his efforts, Sewell earned CFL Defensive Player of the Week honours in Week 3 and was named to the West Division All-Star Team and the CFL All-Star Team. 2013: In 15 games, Sewell recorded 39 defensive tackles, eight sacks, one pass knockdown and one fumble recovery. In Week 16 against Saskatchewan, he recorded two kickoff returns for 24 yards. Sewell was named to the West Division All-Star Team and earned his first career CFL All-Star nod. 2012: In 16 games (10 starts), Sewell recorded 31 defensive tackles and tied for the team-lead with six quarterback sacks. He also played in the East Semi-Final, recording two defensive tackles. Sewell earned a West Division All-Star nod. 2011: In three games, Sewell recorded one defensive tackle. He was placed on the 1-game injured list for Week 5 before being released. College: In four seasons (2007- 10) with the Akron Zips, Sewell registered 223 tackles. He was the second player in school history to be named a three-time All-Mid-American Conference honouree. Personal: Sewell spent one year at Hargrave Military Academy before transferring to Trenton Central High School in New Jersey. He competed in football, baseball and shot put.